Australian Father Warren H. Kinne has served in places as far-flung as the Philippines, Rome, and his most recent assignment, China. In June 2005, Father Kinne held a dinner discussion with a group of his friends in Shanghai, China about migrant workers in that country. For many years, thousands of migrant workers, many from Thailand, the Philippines, and Vietnam, traveled to find blue-collar jobs in the booming economies of China and Taiwan. Unfortunately, these laborers and their families are often subjected to various types of exploitation. Audrey Leung, one of Father Kinne’s friends at this discussion, formed a group to research issues facing migrant workers in Shanghai. Father Kinne, along with his associates, founded the You Dao Foundation in 2005. The Foundation provides informal schooling and financial assistance for the children of migrant workers, many of whom are unable to attend school in China because their parents do not have government permits that would allow them to move their family from the countryside to the city. 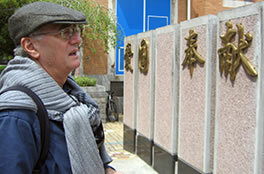 The Columbans had for many years worked with migrant workers in Taiwan and China and been concerned with their plight. The You Dao Foundation is just another way that the Columbans help the underprivileged in their original mission nation of China.